I've decided this is a great relatively-easy pattern for a friend's wedding, and I can make it pretty "neutral" in color as her mother suggested rather than the bright florals that this one uses. 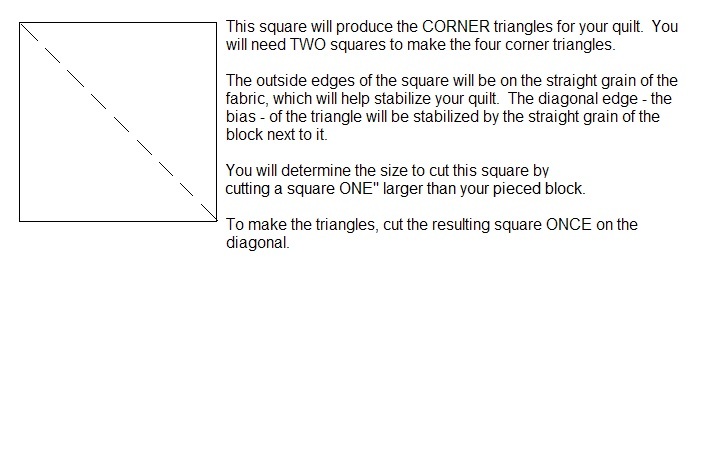 I have questions, though on the side setting triangles, and the 4 corners. Am I missing something? Where are they? 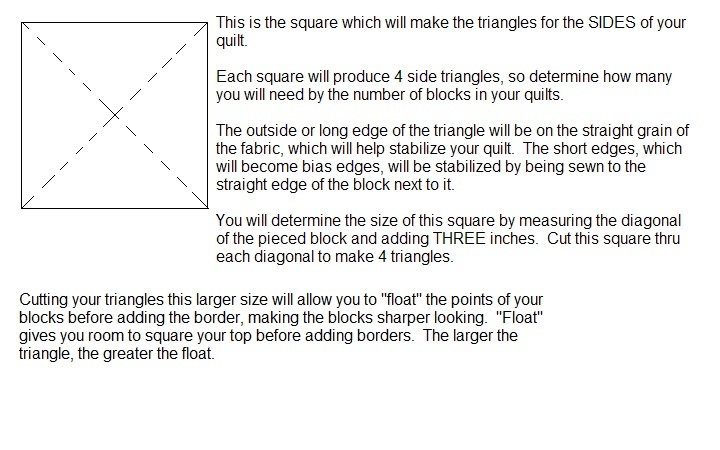 My first quilt was an on-point pattern, and more recently my Blooming 9s... there were triangle pieces on all the ends, and on the 4 corners. What am I missing here? I know I'm just dense and not seeing what's happening on this pattern. It looks like there are no setting triangles. The squares on point run all the way to the edge and you trim off the points to make a straight edge for the binding. I'd be concerned about leaving the 1/4" for the seam so you don't cut off any points when you sew the binding on. they are there. on the sides I see a border of background fabric too. but you will have triangles. love that pattern. did you print it out yet. I haven't read it all but will do so. I see you cut five inch squares of bkground into triangles. not sure if that is all of them though. I would just have to go along making it. metres of background... i'd have to guess at that too. In the very last photo, I sort of see small side triangles and corner ones. they are not mentioned in the directions that I can tell. You should do fine though if you've done on point before. good luck. Last edited by nativetexan; 06-14-2013 at 06:21 AM. Ok - I had to REALLY re- read the pattern several times to figure out what they were doing. This is what I got out of it - all the space generally dedicated to the usual on point setting triangles is being filled with charm squares. Row 1 is actually the top left of the quilt while row 22 is the bottom right. Does this help? Cool pattern! Sounds like you've already got good advice here, I'll be watching for your pictures. Sure does! Thank you...was wracking my brain on that one. And I found some fabric! (Laundry Basket Paint Box by Moda charm squares & yardage for ). It's relatively 'neutral' with some mids & darks for contrast. I think it'll work! Really neat pattern, thanks for posting!